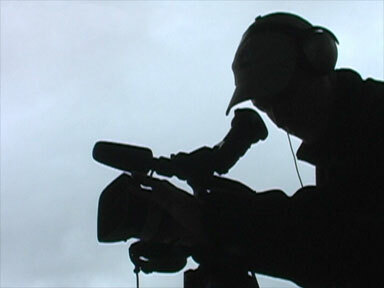 Shooting video for KATH-TV, Juneau, Alaska. 2004. My name is Mikko Wilson, I'm 33 years old, and I live in Juneau, Alaska. I visit Finland annually to participate on the crew of the ASSEMBLY Demo / LAN Party each August. I'm currently the production manager at KTOO Public Media / 360 North, and I teach video production at Juneau-Douglas High School. I worked for many years at KATH-TV, the NBC affiliate in Juneau as an Engineer, Webmaster and News Reporter & Videographer. I graduated with a Bachelor of Engineering, specializing in media engineering, from the EVTEK University of Applied Sciences in Espoo, Finland. I also have my own company STENDEC Media through which I work as a Steadicam operator, freelance media producer and all around techie. I have lived in Finland since summer '01. During the spring of 2002 I spent 6 months serving my national duty in the Finnish Army, marching, running in the woods, and the like. Before Finland, I lived in Juneau Alaska for 4 years and attended Juneau-Douglas High School from where I graduated in 2001. I was born and 'raised' in England where I attended primary and secondary school before moving to Alaska in 1997. Over the years I have been involved in a number of clubs and activities, including: 11 years as a Boy Scout, 3 years as a Ski Patroller, 5 years on Stage Crews, and 17 years producing videos and TV programming. In my spare time I am an avid skier and also enjoy mountain biking and rollerblading. The steeper the hill, the better. I also make videos and hang out on the 'net, working on websites and chatting with friends around the world. A good place to find me online is on one of many online forums I frequent such as www.dvxuser.com. So there's a little about me, and here's my web site with more about me and all sorts of other cool stuff. So browse around and enjoy, then sign my guestbook or e-mail me and let me know what you think of me, my site, and my reality.